This is a simple tutorial on how to rip and copy DVD Game of Thrones to MP4 or other formats for enjoying on mobile, TV etc. Game of Thrones is a popular epic themed series created by HBO and initially shown on April 17, 2011. The series has been renewed for eighth season, the final season, which is on the air in April 14, 2019. It's getting more and more interesting as the story progresses, from the Winterfell, A Knight of the Seven Kingdoms to Great Battle of Winterfell, making audiences too impatient to wait. If you haven't been following the Game of Thrones all the time, that's fine too. This article focuses on ripping DVDs Game of Thrones Complete Seasons on PC/Mac, make you catching up with progress. Generally, a piece of DVD, with the run time 561 minutes around, contains two episodes. That is to say, one season of Game of Thrones is made up of 10 DVDs. It is certainly inconvenient to carry all the DVDs along in your trip. The bumpy route might cause your DVDs slightly damaged or even lost. Therefore, ripping DVD Game of Thrones to make backup in your notebook computer is a must-do. However, if you rip a Game of Thrones DVD free with open-sourced HandBrake, you may find the freeware cannot shake the copy protection of any Game of Thrones (season 1 to season 7) DVDs at all. Any better Game of Thrones DVD ripping solution? Abusolutely, WinX DVD Ripper Platinum comes here in time. After two big upgrades in 2017, it has grown into the most powerful DVD ripping software in the market. By rebulding a brand-new mechanism to check right titles, WinX DVD Ripper Platinum works perfectly on ripping any purchased TV series DVDs, movie DVDs and workout DVDs. Along with the support for both CPU and GPU hardware acceleration, its DVD ripping speed can achieve up to 500 FPS (the fastest ever). 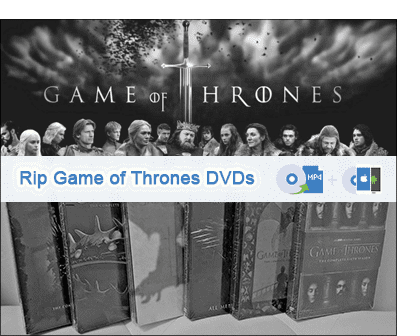 Suggestion on Fast DVD Ripping of TV Series "Game of Thrones"
To begin with, please download the Game of Thrones DVD ripper for Windows - WinX DVD Ripper Platinum (Mac user please download its Mac version). Then just feel free to install and launch it when you want to rip DVD Game of Thrones of any season on PC/Mac. We strongly recommend copying Game of Thrones DVD to ISO image or MPEG2 under DVD Backup Profile of WinX DVD Ripper Platinum, which brings out fastest DVD backup way because it has successfully applied the theory of copying the movie content directly to hard drive without decoding and recoding it. Explanatorily, copying DVD to ISO outputs an original DVD copy without downgrading the movie quality, so does DVD to MPG backup (either with main title or complete audio/subtitle tracks), which literally needs only about 5 minutes to rip a DVD of Game of Thrones without quality loss if your computer is moderately or highly configured with GPU acceleration enabled, much faster than converting DVD to other video formats. Step 1: Run the software and load DVD disc/folder/ISO file to the software by clicking corresponding button on the top left tool bar. If you desire to backup DVD to ISO image , please just insert the DVD to the DVD-ROM in advance. Step 2: Navigate to DVD Backup under output profile, then choose one option as the output. DVD backup offers the fastest ways as expained above, and 350+ formats/devices options are also available for Game of Thrones DVD ripping. 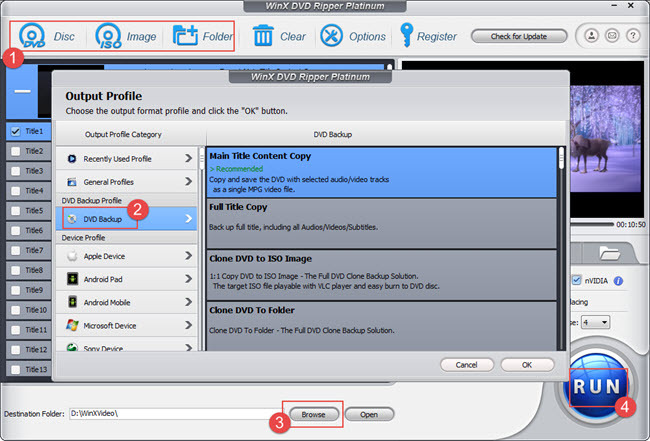 If you import a VIDEO_TS folder or ISO image from your computer, this DVD rip software will only display two DVD backup items for you, namely, "Main Title Content Copy" and "Full Title Copy". Step 3: Choose a path to store the output video by clicking "Browser". Step 4: Hit RUN button. Step 5 (for mobile users only): Transferring digital video clip in MP4 or so to Android is quite easy with only an USB cable, but that's not the same thing if you wanna move Game of Thrones video into iPhone or iPad. Most users cannot stand the complicated iTunes, and just try some best iTunes alternatives like WinX MediaTrans, to free transfer movie from computer to iPhone, iPad running on iOS 7-12. ● You can crop video to remove black bars. Disclaimer: Digiarty Software does not advocate ripping copy-protected DVDs for any commercial purpose and suggests referring to the DVD copyright laws in your countries before doing so. Still have trouble about ripping or copying DVD Game of Thrones Season 1/2/3/4/5/6/7? Please feel free to Email Us >>. Note: Game of Thrones Season 8 is scheduled to premiere in April 2019. You can free download Season 8 video with WinX Online Downloader from online sites. A tutorial to rip DVD House of Cards Season 1 to 6 episodes into a single file on tablets, smartphones, TVs etc. to enjoy anywhere anytime. Best free online video downloader helps you easily free download TV shows/series from YouTube and 300+ sites in HD quality. Here we round up top/new HBO TV shows/series hitting the screen in 2016, from Game of Thrones, Vinyl to Westworld. Also learn how to free watch the HBO series offline! Part 2Suggestion on Fast DVD Ripping of TV Series "Game of Thrones"